Difficult to decide what to gift especially when you have want to give a memorable, long lasting, forever kind of gift. What adds to the confusion is the Gifting Fund" collected between friends & relatives - so many people contributing for a Cherish able Gift. We help you address this situation - Introducing Kanika Gift Currency. 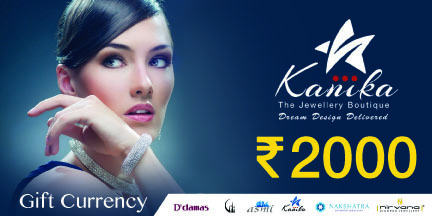 Your money is converted to precious Metal & Stones like Gold & Diamonds which are "FOREVER". The person who has been gifted the Currency can buy something they like. They can also add some more money to the funds and get something substantial too. This Gift Currency cannot be exchanged for cash/gift card/credit notes. This gift Currency can be used for the purchase of Gold & Diamond ornaments except Gold Coin/Bar/Platinum/Solitaire/Nosepin.